“The Terminus Agenda” part two! 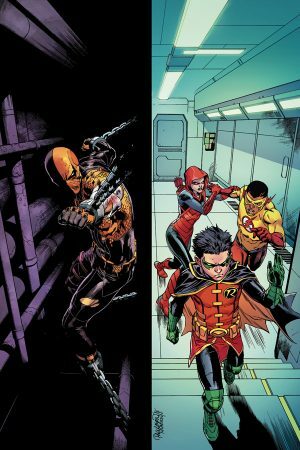 Captured by the newest group of Teen Titans, Deathstroke finds himself powerless and restrained inside Damian’s secret prison. 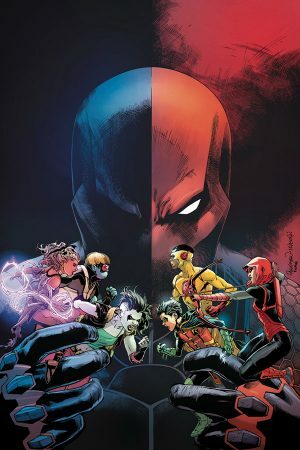 But when a crisis erupts, only Deathstroke stands between the Teen Titans and total disaster – can Robin swallow his pride to protect his team? “The Terminus Agenda” part three! After their last mission nearly ended in disaster, the Teen Titans are coming apart at the seams. As Deathstroke’s influence over Damian reaches new heights, the team must evaluate how far they are willing to go in their war on crime. And with the Teen Titans seemingly on the brink of destruction, a new threat reveals itself. And the worst enemies of all… come from within!